Basal-cell carcinoma (BCC) is one of the most common skin cancers. In general, it occurs mostly in the central region of the face, where sun exposure is pronounced. From this reason, ultraviolet rays are thought to be the main factor in the development of BCC. We herein describe a case of pigmented BCC on the lip of an elderly person and also reviewed previous reports on labial BCC. An 89-year-old Japanese male visited our department, complaining of a small nodule on the upper lip, which appeared 2 years previously. He had a history of cerebral infarction and had received warfarin and anticoagulation therapy. The patient's family history was noncontributory. 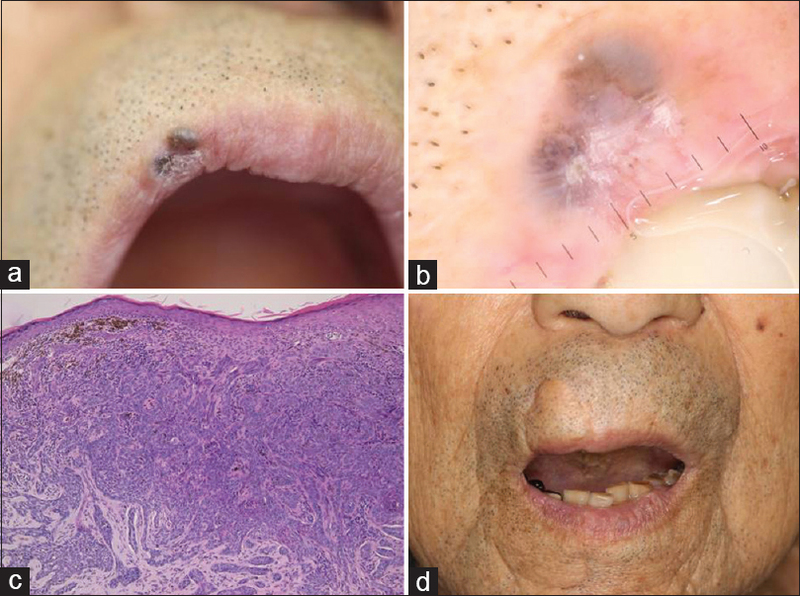 Physical examination revealed a 6 mm × 4 mm, irregular-shaped, slightly elevated blackish nodule on the vermilion border and the outer mucosa of the right side of the upper lip [Figure 1]a. Dermatoscopic examination showed arborizing vessels and large blue–gray ovoid nests [Figure 1]b. A biopsy specimen revealed multiple nests of basaloid cells with peripheral palisading in the mid-dermis [Figure 1]c. The nodule was surgically removed at the plastic surgery department of our university hospital. There was no local recurrence or regional lymph node metastasis within a 2-year follow-up period [Figure 1]d. Written informed consent was obtained from the patient. BCC occurring on the lip has been rarely reported although the estimated low incidence could be due to the underreported status. It is relatively easy to diagnose BCC by the clinical appearance; however, there are several differential diagnoses including malignant melanoma, pigmented poroma, nevus, and other pigmentary tumors. 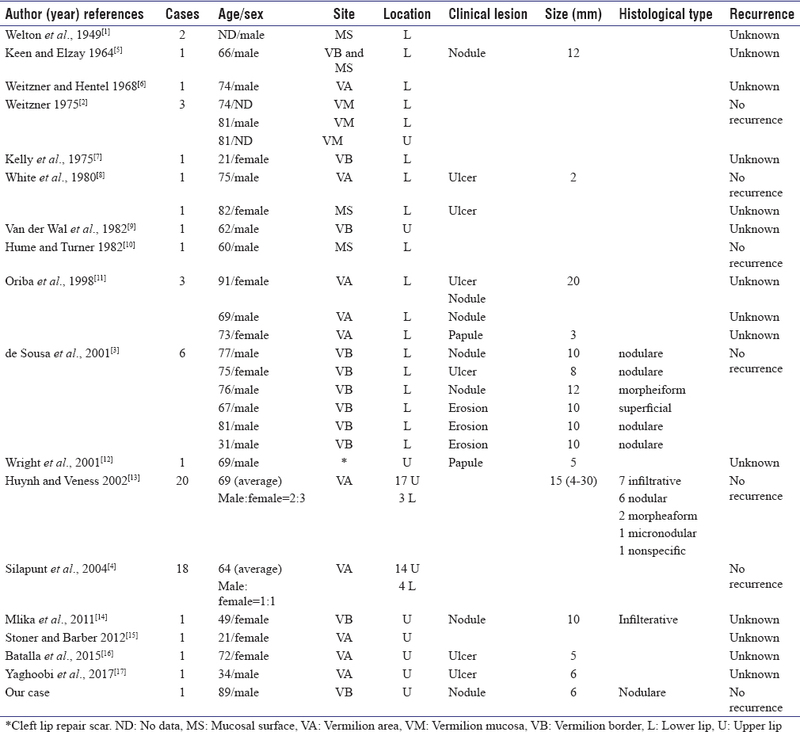 To the best of our knowledge, there are four large case series and limited number of case reports on BCCs of the lip in the literature [Table 1].,,, In total, 64 cases have been reported including our patient. The male-to-female ratio of these cases was 1.1:1, and the mean age was 66.4 years. Of the 64 cases, 39 (61%) cases and 25 (39%) cases occurred on the upper lip and on the lower lip, respectively. Clinical features included seven nodules, six ulcerative lesions, three erosive lesions, and two papules (others were undetermined). The median size of the lesions was 12.3 mm (3–30 mm). Histopathologically, 25 cases were classified into the following types: nodular (44%), infiltrative (32%), morpheaform (12%), micronodular (4%), superficial spreading (4%), and nonspecific/mixed features (4%). Lymph node metastases were not revealed in any studies. Silapunt et al. showed the evidence of tumor infiltration of the nerve, muscle, or vessels in 6 of their 18 cases. de Sousa et al. described a patient with morpheaform type BCC infiltrating deeply into the orbicularis oris muscle and two cases of nodular type neoplasm infiltrating into the superficial muscular layer. These studies have revealed that BCC on the lip has a tendency to locate on the upper lip. Regarding the pathogenesis of BCC of the lip, several hypotheses have been suggested. Some authors insisted that tumor cells arise from pluripotent epithelial cells, while others considered that they arise from free sebaceous glands (Fordyce's spots) or traumatic epithelial implantation., The lip epithelium contains four parts: the skin, the vermilion border, the outer mucosa (vermilion), and the inner mucosa. Because of the thin submucosal layer of lips, BCC easily invades deeper structures of the lips. In the surgical treatment of cancer of the upper lip, proper restoration of the lip form and function is of paramount importance as the lips play critical roles in feeding, speaking, and facial expression, among others. Therefore, it should be considered that the goals of lip reconstruction are both functional and esthetic. Full-thickness defect involving over one-third of the lip must be repaired with tissue transfer. Abbe flap is a well-established method using residual lip tissues in two stages and has the advantage of augmenting the upper lip with similar tissues from the lower lip and remaining the balance between upper and lower lips. The flap is designed with half the size of the defect, elevated based on a main artery of the labial artery, and transposed into the defect. The pedicle of the flap can be divided 10–14 days after surgery when the blood supply has been established. Plastic surgeons in our hospital performed the resection of the BCC with 6-mm safe margin and the reconstruction using the Abbe flap. Our patient had a good course after discharge without either local recurrence or metastases during 2 years. Welton DG, Elliott JA, Kimmelstiel P. Epithelioma; clinical and histologic data on 1,025 lesions. Arch Derm Syphilol 1949;60:277-93. Weitzner. Basal-cell carcinoma of the vermilion mucosa and skin of the lip. Oral Surg Oral Med Oral Pathol 1975;39:634-7.
de Sousa J, Sánchez Yus E, Rueda M, Rojo S. Basal cell carcinoma on the vermilion border of the lip: A study of six cases. Dermatology 2001;203:131-4. Silapunt S, Peterson SR, Goldberg LH, Friedman PM, Alam M. Basal cell carcinoma on the vermilion lip: A study of 18 cases. J Am Acad Dermatol 2004;50:384-7. Keen RR, Elzay RP. Basal cell carcinoma from mucosal surface of lower lip: Report of case. J Oral Surg Anesth Hosp Dent Serv 1964;22:453-5. Weitzner S, Hentel W. Multicentric basal-cell carcinoma of vermilion mucosa and skin of lower lip. Report of a case. Oral Surg Oral Med Oral Pathol 1968;26:269-72. Kelly DE, Klein KM, Harrigan WF. Lip reconstruction following resection for an unusual basal-cell carcinoma. Oral Surg Oral Med Oral Pathol 1975;40:19-26. White SW, Davis RA, Rodman OG. Surgical management of basal cell carcinoma of the lower lip. J Dermatol Surg Oncol 1980;6:751-4.
van der Wal KG, Mulder JW, Beetstra A. Basal-cell carcinoma of the vermilion border of the upper lip. A case report. Int J Oral Surg 1982;11:77-9. Hume WJ, Turner EP. Basal cell carcinoma of lip mucosa. Br J Oral Surg 1982;20:248-55. Oriba HA, Sandermann S, Kircik L, Snow SN. Basal cell carcinoma of the vermilion zone of the lower lip: A report of 3 cases. Oral Oncol 1998;34:309-12. Wright MW, McCarthy RA, Kelly EB, Wright ST, Wagner RF. Basal cell carcinoma arising in a cleft lip repair scar. Dermatol Surg 2001;27:195-7. Huynh NT, Veness MJ. Basal cell carcinoma of the lip treated with radiotherapy. Australas J Dermatol 2002;43:15-9. Mlika RB, Kerkeni N, Jebali A, Zghal M, Debbiche A, Ayed MB, et al. Basal cell carcinoma of unusual site. Ann Pathol 2011;31:32-5. Stoner PL, Barber MF. Site-specific inheritance of basal cell carcinoma. Cutis 2012;90:252-4. Batalla A, Encinas-Muñiz AI, Gutiérrez-González E, de la Mano D. Basal cell carcinoma on the vermilion lip. J Dermatol Case Rep 2015;9:25-6. Yaghoobi R, Ranjbari N, Pazyar N, Foroozan M, Feily A. Basal cell carcinoma of vermilion mucosa of upper lip: A rare case report. Acta Med Indones 2017;49:255-8. Moretti A, Vitullo F, Augurio A, Pacella A, Croce A. Surgical management of lip cancer. Acta Otorhinolaryngol Ital 2011;31:5-10. Brody I. Contributions to the histogenesis of basal cell carcinoma. J Ultrastruct Res 1970;33:60-79. Luna-Ortiz K, Güemes-Meza A, Villavicencio-Valencia V, Mosqueda-Taylor A. Upper lip malignant neoplasms. A study of 59 cases. Med Oral Patol Oral Cir Bucal 2012;17:e371-6. Miles AE. Sebaceous glands in the lips and cheek mucosa of man. Br Dent J 1958;105:235.